. hatsu hibari 初雲雀 first lark . The popular and attractive Barn Swallow, found worldwide, is the most widespread of the swallows. In the western hemisphere, it winters in South America, but migrates northward to breed over most of North America. A round trip may cover 14,000 miles. They prefer open country, and readily nest on man-made structures. They perform an important economic function as they cruise low over lawns, fields, lakes, and ponds, consuming large numbers of flies, aphids, beetles, bees, moths, mayflies, dragonflies, grasshoppers, caterpillars and other insects. Historically, Barn Swallow populations have suffered from competition with House Sparrows. The use of pesticides and the resulting reduction of insects has also contributed to their decline. Unusually cold weather during the nesting season also reduces the availability of insects and may lead to starvation of young and adults. Fortunately, Barn Swallows readily adapt to man's artificial structures. Their populations are doing well in many regions, but in some regions declines are still occurring. Swallows are the very epitome of summer. In Britain they are distributed throughout the whole country. In Europe swallows breed northwards as far as the Arctic Circle. During spring successive waves leapfrog northwards over each other. In fact pioneers in southern Europe will have reared first broods to the flying stage before the last migrants pass through to reach the most northerly breeding areas in early June. The swallow is a beneficial bird that is found almost worldwide. 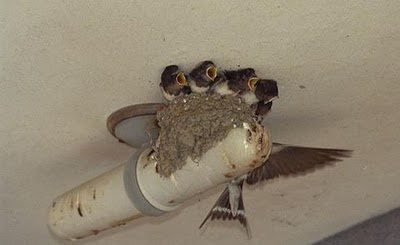 There are many varieties of swallows, and they have interesting nesting and feeding habits. The silhouette of a swallow is unmistakeable with its sharply pointed, angled wings and forked tail. They are often seen darting swiftly across the sky, catching insects in midair. According to the book "Peterson First Guides: Birds", written by Roger Tory Peterson and published in 1986 by Houghton Mifflin Company, there are seventy-five types of swallows worldwide. Eight of the seventy-five species can be found in Canada and the United States. The same article says five additional species are considered strays. Last week in the south of England, another look at the swallows in transit, the "local" swallows having already left. Swallows are definitely (for me at least) a kigo for the European spring (arrival) and the European autumn (departure). was meint man von dir? Oscar Wilde's lovely story "The Happy Prince"
One of the two principal characters of the story is the little swallow, late for its return to Egypt for the winter. It takes only about 20 minutes to read. Highly recommended by Isabelle Prondzynski! Thus the combination in a landscape of the swallows that feed over streams and ponds and the willows that grow along their margins would be natural. Every Chinese family welcomes the swallow, since it is thought to be very lucky to have a pair of these birds build a nest near a house. The swallows are usually shown in pairs, for according to the Chinese that is the "nature" of the bird. 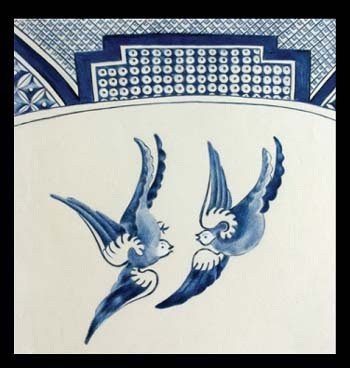 "Two flying swallows" is a phrase symbolic of a happily married couple, and swallows have come to be emblematic of marital constancy and good luck. A good omen, the swallow appears in some of the earliest myths and legends as a symbol of fertility. It is also associated with marriage and birth rites, the longevity cult, and appears in the Chinese materia medica. The willow is one of the most popular trees in China and is seen everywhere, clustered about houses in towns and villages or along the banks of streams and ponds. Valued for its usefulness as well as its attractiveness, the willow typifies pliancy and softness. It has special meanings for the Chinese in connection with feminine traits and attributes : a slender waist is "willowy"; arched eyebrows are "like a willow leaf." The association of swallow and willow is a traditional one among the Chinese and has particular significance for them. A favorite subject in art and poetry, the combination of swallows and willows signifies spring. The double motif also implies the change of seasons from spring to summer, and thus alludes to the passage of time in human affairs. Together, the graceful flight of the swallow and the delicate sweep of willow branches suggest beauty and elegance. Another meaning attributed to this combination is companionship. The swallow is gregarious and friendly, and the willow growing in the courtyard of the house seems like a close companion.
. Kamitsubame, kami tsubame 紙つばめ paper lark . 乙鳥（つばくら）tsubakura, in the dictionary is also read itchoo いっ‐ちょう, otchoo おっ‐ちょう. They all can give a haiku a slightly different meaning. the big site as you. I haven’t been able to figure when swallows actually arrive in China or even what variety of swallows appears in China, despite this exhaustive article on swallows published by the amazing Gabi Greve in her compendium of kigo, the seasonal words used in haiku. 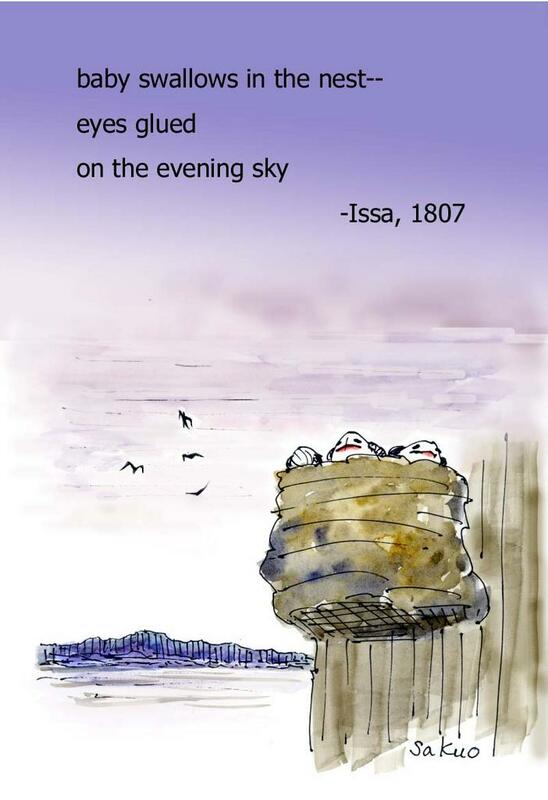 You can also find more spring kigo words and my comments on writing seasonal haiku in this newsletter I wrote in April 2005. Here in rainy England the return of the swallows, from their winter vacation in Africa, is THE kigo of summers start in our folk imagination. Also a general kigo of summer - but the start is the key attribute. THE national kigo of summers start in rainy England! This hokku is from the 3rd month (April) of 1815, when Issa was back in his home town. It doesn't seem to be about human babies, since ko can refer to the young of many species. Skylark chicks are fed by both parents, so I assume Issa is watching both. He is impressed by the way the parents always keep close to the nest and feed and protect their young until the chicks are able to leave it. Issa may be envying the chicks, since his mother died when he was very young, and he and his stepmother didn't get along, so his father sent him away to find work in Edo at 14. Two years before this hokku, Issa received his inheritance after a long struggle, but his stepmother remained cold to him.